To continue our yoga lessons, let’s explore the niyamas – those ever-so-important personal ethics. Niyamas are personal ethics necessary for taking care of and developing ourselves in order to live more balanced lives. Cleanliness and purity of body, mind and environment is outermost, followed by an outer and inner contentment. When we seek personal growth and freedom, it is paramount that we develop our bodies, minds and spirits. The niyamas teach us how. sauca – purity, cleanliness – keeping all the energies around us clean and smooth. This isn’t just about bodily cleanliness (although that does play a part), this is about everything around us and all the energy being orderly and distinct from one another. santosa – contentment – being okay with what we have and what we have obtained. Knowing that we are in the right place at the right time. Knowing that what will happen will happen in it’s own time…and that time will be right. Knowing that what we have right now is what we need right now. tapas – practice causing change, “heat” – There’s a time for contentment and a time to work a little harder and push a little more. Being content doesn’t mean being lazy. Learn to balance the two so that you know when to move and when to be still. svadhyaya – self-study/observation (especially mantra) – Look within. Feel what is going on in your body, in your heart, with your spirit. Know where you are and know where you are going. Know yourself. And the only way to know yourself is to get to know yourself. And the only way to get to know yourself is to look inside. Spend as much time studying yourself as you would studying anything else. Spend more time doing it. You are the most important study. Take that time. You owe it to yourself. Be in a constant state of inner reflection and inner study. With that comes wisdom. Why are you here? What are you doing with your life? What should you be doing with your life? Why are you here? isvarapranidhana – devotion, surrender to a higher force – Your life is truly in the hands of the Divine. There is a bigger purpose. God, as the name for the universal life force, is worshipped in different forms by every religion and faith. The name we use doesn’t matter-the dedication does. If we want to change the world, we must change ourselves. We must work on ourselves. We must notice ourselves. Live the niyamas. Practice them. Get familiar and in touch with them. Go out into this world knowing that today and every single day, you are working on you and you are thus changing the world through your own heart and your own internal reflections. We’re all on a mission to find it, right? Our peace. Our inner Zen. But how do we go about that? How do we find Zen or Peace in a world full of chaos and disturbances and drama? Step by step instructions for getting you to that place of happiness and love without feeling the need to change the world. We’ve all heard it before, right? The key to inner peace is to breathe. But we’re all breathing all the time, right? So is it just deep breaths that help? Well…sort of. Taking a deep breath will certainly help almost immediately to calm your heart rate, settle your mind and certainly bring about a pretty quick (yet short lived) sense of “peace” but is that one deep breath going to get us to actual peace and Zen? Probably not anytime soon. The key to “just breathe” being a long term solution is to train ourselves to breathe deeply on a consistent basis and to practice breathing mindfully (being fully aware of each breath we take). The easiest (maybe only??) way to do this is to practice, practice, practice. Take a few moments each day to sit in meditation and just breathe…taking special care to notice the inhale and the exhale of each deep breath. Your mind might chatter but that’s okay. The more we ignore the chatter in our minds, the less our minds will chatter. The mind eventually gets tired of talking to itself, so if you acknowledge the thoughts as they come up. Mentally say “Stop” and get back to your breath focus, eventually, the mind will stop trying to interrupt your meditation. 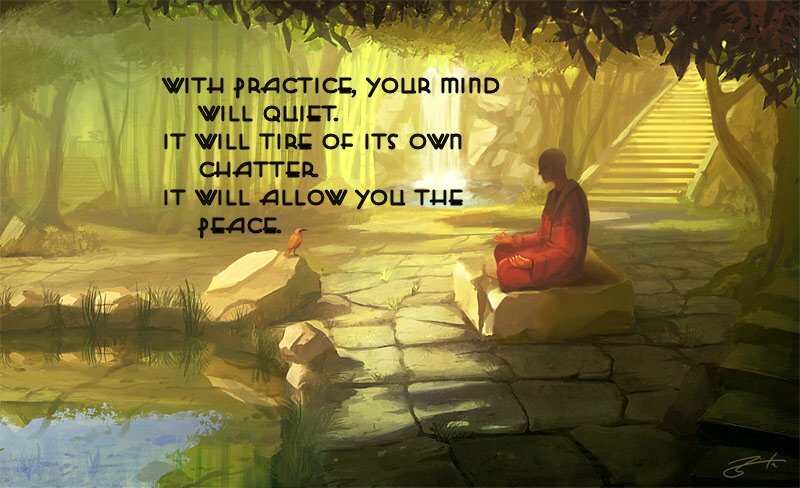 It will learn (through your training) that meditation is not the place for it to chatter. It’ll move on to a more appropriate time. Sometimes it helps to visualize during a meditation. Visualization can keep the mind “occupied” and not allow it time to wander. Try this: Visualize a white light that holds all the love we you can possibly handle, all the peace in the world, all the good in your fellow humans and visualize that light coming into your soul as you breathe in…visualize that bright white light filling you up with peace…filling you up with love….expanding because you personally can only hold so much before you have to share. Visualize that bright light expanding from the tips of your toes to the very top of your head and then out….past you…past your home and family…touching them all…past your neighborhood….out to the entire world and on to the universe…touching everything and everyone…swirling about…changing the feel…changing the world. Visualize that light, as you inhale, spreading peace to all living creatures. Then, as you exhale, feel the tension release from your body. Feel yourself relax just a little bit. Visualize yourself letting go. Letting go of people and actions that are weighing you down. See yourself letting go of situations that are outside of your control. See yourself losing the feeling of anger and heaviness you feel when others behave in ways you do not approve. Watch and feel yourself getting lighter and calmer. Breathe in and fill yourself back up with the love and peaceful light of the world. Feeling it expanding joy from your heart out. Feel it creating love and using you to spread that love to the ends of the earth and beyond. Practice this meditation/visualization at least daily but preferably twice a day (morning and night). You may not notice much Zen in the beginning, but after time…after training our minds to breathe mindfully…our breathing will automatically start to go deeper, last longer and produce a much more consistent feeling of peace in our hearts. Eventually…after we dedicate to a consistent meditation and prayer practice….that peacefulness we seek is with us a lot more often that we ever knew could be true. And remember…this includes the actions of others as well. There are so many things in this life that we can control and all of those things point back to ourselves. We can control ourselves. We can control nothing outside of that. I know it can be frustrating when other people don’t believe the same things we believe, don’t act in a manner that we would like them to act, don’t do things the way we want them to or the way we believe is “right”. I know it’s frustrating when we’re in one place on our journey and we want so much for others to join us and believe us and follow us. I know how it feels to want to shake someone and tell them to stop behaving in a certain way. Believe me, I know how it feels to want to change others…to want to change the world…to believe that the only way to change the world is to control and change others. But here’s the real truth. We cannot control others. We are not responsible for the actions of others. We do not need (nor should we want) to change other people. Here’s the key though: We CAN change ourselves. We CAN control ourselves. We ARE responsible for our own actions. And by taking responsibility for only our own actions and by changing ourselves and by controlling ourselves…we CAN change the world. If everyone participates in taking care of themselves…the world changes. But be careful…it’s not up to you to convince the rest of the world to change or participate. Change yourself and the people around you will either change with you or they will go away. Either case is outside of your control. Everything you do is about changing yourself. And believe me, we all have room for a little change. Let’s focus on that sometimes, okay? I don’t know if it’s the age we live in or if it’s a matter of my own experience due to living in the Western World or if it’s a reality, but so many of us are afraid of being generous. It’s like we truly believe there is only so much to go around…only so much money…only so many jobs or promotions or opportunities…only so many customers or chances or things. I say that’s a very, very limiting belief. In my personal experience, the more we support others and lift them up and help them succeed, the more successful we become. I’ve seen it time and time again. One person helps another and somehow, that helpful person becomes even more successful, happier and richer (in so many ways). If you are afraid of the success of others…if you are afraid to be generous…if you are afraid to help someone else up…please, take time today and sit with that in a silent meditation. Pray about it. Ask the question: Do I really believe there is not enough to go around? Do I really believe we can’t all be successful. And if the answer is yes, why? And then go out there and help someone else find success. And when you do, sit with those feelings in meditation as well. Does it feel good or are you afraid? Do you want to feel good like this again or why are you still afraid? Meditate on it. Pray about it. Teach yourself to be generous to others. See how that one little change affects not only you but the people around you too. I think it’s important to always be kind to others. Now, I’m not perfect, this in no way means I’m always kind. It means I know I should be and I strive to be. And it means I believe it is important for you to do the same. Being kind sounds easy because it is…when we’re talking about the people we love. But being kind is very, very hard when we’re talking about people who are not treating us with kindness. When our instincts kick in and we want nothing more than to lash out or get revenge or hurt someone the way they’ve hurt us. Being kind can all of a sudden take every ounce of our restraint. Being kind can be the farthest thing from easy. But…remember earlier when we talked about only being able to control ourselves? Well…we cannot control whether or not others are kind. We can only control how we are. And also remember…it’s important to be kind to yourself as well. Sometimes the kindest thing we can do (for ourselves and for the other person) is to walk away. There’s no reason any of us ever have to stay in hurtful situations or participate in hurtful conversations or be a part of anything that doesn’t feel good. Consider, next time you want to lash out, do the kind thing instead, remove yourself from the situation. People get used to it and they don’t really like it. More often than not, the people you are walking away from will begin to change. But again…that’s not really your concern. Whether you choose to do this in mediation, in a long bath or a long walk, by taking a vacation alone or by sitting outside enjoying the weather, it is critically important to take time to be alone with yourself. There are so many of us in this world that think we know ourselves but we really don’t. We can’t. We aren’t even comfortable being with ourselves for a few minutes at a time. Make it a practice to get to know yourself again. Be alone with your thoughts. Write down your dreams (you’ve probably forgotten so many of them by now). Listen to your mind. Pay attention to what consumes it. Hear the stories you are telling yourself. Grasp on to your daydreams (whether good or bad). Take care of yourself. If you’re beating yourself up, you won’t find peace…but the first step to changing how you treat yourself is paying attention to how you treat yourself. If you can’t see what you’re doing that’s hurting you, you probably won’t stop the hurt. Get to know yourself again. Learn to love yourself again. I know these steps are not a full plan for everyone…and as I said, finding peace is probably not a “one size fits all” deal…but I do believe it is a really good start and I believe with everything in me that making these changes in ourselves and taking this time to focus on ourselves will absolutely bring peace to our hearts more often than not. So I encourage you…sit with these steps…try them out for a week or so…see how it feels…and then come back and tell us all about it. If there is ever anything we can do to aid you in your journey to finding your own Zen…we’re here to help. Last week we learned about Astanga – The eight limbs of yoga. Today, let’s discuss the first…Yamas…Social Ethics. Yamas are social ethics that allow one to coexist peacefully in community. Nonviolence is the first and foremost ethic. These are all things that we must take with us OFF the mat. Take the yamas out of the studio, off your mat and into the world. Living a life filled with love and understanding rather than pain and violence. Can you imagine a world filled with people committed to the yamas? We can…and we’re bringing it to you…to our community…in the form of a yoga studio that doesn’t just offer exercise. In the form of a yoga studio that offers teaching, community, fellowship, meditation, peace, love and compassion. Live the yamas this week. Let us know how that feels. One of the hardest things to explain to people who don’t understand is the use of sheepskin in Kundalini for yoga and meditation. Sheepskin is not required and is very much a personal decision. For my part, I do use it in my kundalini practice…and I know many others who do not. The goal of this post is not to encourage you or sway your personal decision in either direction, rather, it is in the hopes of helping you understand and maybe living with at least a tolerance for those who practice their yoga differently than you practice yours. Why use sheepskin for yoga & meditation? 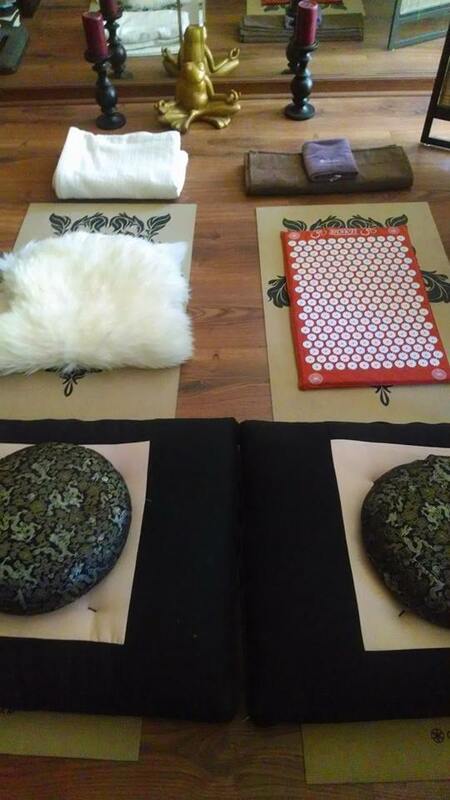 It is traditional for many Kundalini Yoga practitioners to use sheepskins on which to do their yoga. This is personal preference. Yogi Bhajan recommended the sheepskin for meditation, as it created an insulation between the yogi and the magnetic pull of the Earth. Indeed, many people experience deeper states of connection to their Self and the Universe when using a sheep skin as compared to a sticky mat or cushion (synthetic yoga mats are taking up to 1/3 of the aura away from a person). He said it was traditional for a yogi to use the skin of an animal which had recently died because it is also said to be a blessing for the animal, it helps to liberate their soul. The sheep skin is great for yoga, it is soft & cushy and great for the ankles when meditating. It has non-allergenic properties. Don`t use it as a rug, but rather as a sacred space, a great addition to your altar or meditation room! Remember…it is not mandatory to use sheepskin for Kundalini practice…it is your personal choice and nobody should be able to tell you what to do either way. I do however, encourage you not to judge. I’ve see some very heated discussions with regard to this topic on the internet and it saddens me that anything about yoga could cause so much pain and discomfort in people. Yoga is meant to bring us together as one community…don’t let discussions of a topic we can’t possibly agree on be something that tears us apart. Yoga can be so confusing…especially when your instructor starts using words you’ve never heard of or you hear some chant and wonder “What in the heck did I just get myself into?? ?” Because of this, and the general misconceptions about what yoga is, I thought it would be fun to post a new lesson each Wednesday along with some Sanskrit names and definitions to help spread knowledge about how certain terms are used in yoga and…well…what it all means. As many of you know, Sanskrit is the language of yoga and was developed to help spread the understanding of the spiritual insights of ancient sages. Knowing and understanding certain terms will help guide you on your path by giving you a much deeper knowledge of what yoga is truly all about (because there is so much more to it than an exercise program). Please keep in mind that Sanskrit, as with many languages, has words that are very complex and difficult to translate into English. There may be many, many other ways to define a word that I post here and I welcome all comments so that we can share each other’s knowledge and the teachings we’ve received. On another note – The definitions and lessons here are from the book “The Language of Yoga” by Nicolai Bachman. I won’t be posting everything (this will be a very, very condensed version)…the book itself has a LOT more information as well as CDs to assist with pronunciation, etc. The book is worth buying (or viewing at Kahanu when we finally open our doors). The information provided there is priceless. The information provided here is basic. Astanga – The eight limbs of yoga. The term Astanga refers to the eight limbs of yoga, which are described in Patanjali’s Yoga Sutras. They provide a practical way of living happily in the world while gradually moving one’s consciousness inward. yama – social ethics, “restraints” – The most external limb. niyama – personal ethics, “internal restraints” – These are like internal yamas. asana – posture, sitting – They keep our bodies flexible, strong and healthy. pranayama – breath regulation – This begins to purify the mind. pratyahara – internalization of the senses, “drawing back” – This brings you even further inward by removing the sense distractions from the mind. dharana – focus, concentration – Enables one to focus a stream of attention onto a single object. dhyana – maintaining a focus, meditation – Maintaining focus for a long time. samadhi – complete absorption – Meditation is very completely absorbed. This is the final “goal”. Whew! For lesson one, that’s a lot to take in! But trust me…the more you read, the more you will understand and the more you understand, the stronger and deeper your practice will be. Check back here often…we’re just getting started! It can be so easy to judge others. It is so easy to project our own reality into the lives of others….especially when it comes to those who think, look, speak or feel differently than we do. Today, realize and respect the fact that we are all on our own journey and that we are all in different places on that journey. Whether you are at work, in school, taking a yoga class or simply walking down the street, notice how often you look at someone else and judge them for being different than you. Notice how easily you project your stereotypes on them based on your own experiences in life…based on what you’ve learned…based on what others have told you. Notice how quickly you decide who they are, who they are not and who they ought to be. Then stop. Stop and realize that you know nothing of their reality. Realize you know nothing of what they’ve been through, what they’re going through or what they’ve survived. Realize that you only know one thing: You know that this is a fellow human being with thoughts and feelings and loves and losses…just like you. Take a step back and notice how we are all connected…how we all breathe the same air and walk the same paths. Soak in that feeling of being human and sharing this planet with so many other living creatures that you know nothing about. Now…turn your focus inward. Notice your own breath. Notice your own heart. Feel it open to love and kindness and compassion. Feel yourself connect with the world around you. Feel the smile of a child you’ve never met…the tender touch of an elderly man or woman with years of wisdom shining in their eyes…the silent tears of someone in need…the bubbling laughter of a joyous moment…the gentle hug of a loved one. Look inside yourself. Notice how you judge. Not just others…notice how you judge yourself. Now…turn your focus outward once again. Notice the breath of others. Notice their hearts. Feel them open to love and kindness and compassion. Feel the world around you connected to YOU. See your childlike smile…your wisdom…your tears…your laughter…your hug.